This image acquired on Jan. 4, 2012 by the Pleiades satellite shows part of Dubai in the United Arab Emirates. This space wallpaper acquired on Jan. 4, 2012 by the Pleiades satellite shows part of Dubai in the United Arab Emirates. 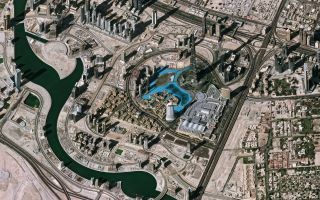 The light blue area near the centre of the image is the man-made Burj Khalifa Lake. Next to the lake sits a skyscraper that is the tallest man-made structure in the world. Its long shadow is cast to the north (to the right in this image). The large, dark area is where the saltwater Dubai Creek is being extended as part of the construction of the Business Bay development.